Love desserts! We linked up a wonderful orange chocolate creation this week. So many cute and delicious features. Thank you so much for hosting the party. Have a great week. Thanks for the party! Have a great week, Lisa! Can’t wait to hear back from you, thanks for everything! Thank you for the feature! Everything looks so delicious!! I just found your blog, and it is gorgeous! 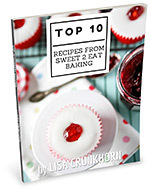 Looking forward to reading more sweet recipes from you! Thank you Lisa for hosting the party. Have a great day! Dropping in from Bloggy Mom’s hop. I hope you can drop by sometime. I am a follower & would love to have you visit. I’ll try to remember to come link up when I have a recipe to share, looks like a fun party!